Málaga CF has scored 12 goals in LaLiga 1|2|3 from inside the area, six with a header and the others with the feet. Paraphrasing the famous title of the Carol Reed film, starring Charlton Heston as Michelangelo, Málaga CF turned the match around from a potential defeat to an ecstatic victory. 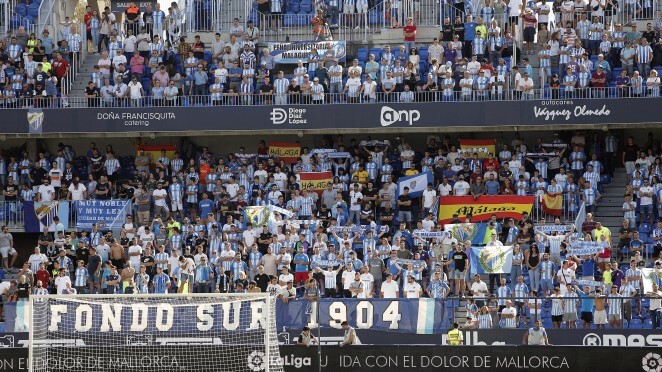 The Malaguista goalkeeper defended the three stripes at # MálagaAlbacete and thanked the fans for their support: “When the team is losing we need help from the fans and we got it". The Málaga CF coach was happy with the comeback. “The team knew how to react, took possession and rebuilt chances,” he said. Málaga CF beat Albacete Balompié, in La Rosaleda, in the 9th round of LaLiga 1 | 2 | 3. Bela advanced the visitors with a penalty in the second half, but a fast 'back to back’ from Blanco Leschuk secured a great comeback for Muñiz’s team. Málaga CF and Albacete Balompié will lock horns tomorrow, at La Rosaleda stadium on LaLiga 1|2|3 matchday 9. Kick off on tomorrow’s bank holiday is at 16:00. Juan Ramón Muñiz has announced the list of called-up players for #MálagaAlbacete. Goalkeeper, Andrés Prieto was the only new addition in relation to the previous line-up for the match in A Coruña. Juankar and Renato Santos completed the session normally ahead of #MálagaAlbacete on Friday. Whilst at the Ciudad de Málaga stadium, the Blue and Whites’ coach talked about #MálagaAlbacete: “We know that in order to win a game in this category we have to play very well”, he affirmed. A Malaguista legend and icon in Albacete, Sebastián Fernández Reyes ‘Basti’ will enjoy Friday’s match in a very special way, at La Rosaleda, between Málaga CF and Albacete Balompié. LaLiga 1|2|3 matchday 9 between Málaga Club de Fútbol and Albacete Balompié will take place at La Rosaleda stadium. Aitor Gorostegui Fernández-Ortega awarded J. Ontiveros (54'), F. Ricca (74'), Adrián (77'), Harper (89') from Málaga CF y Caro (45') from Albacete BP.